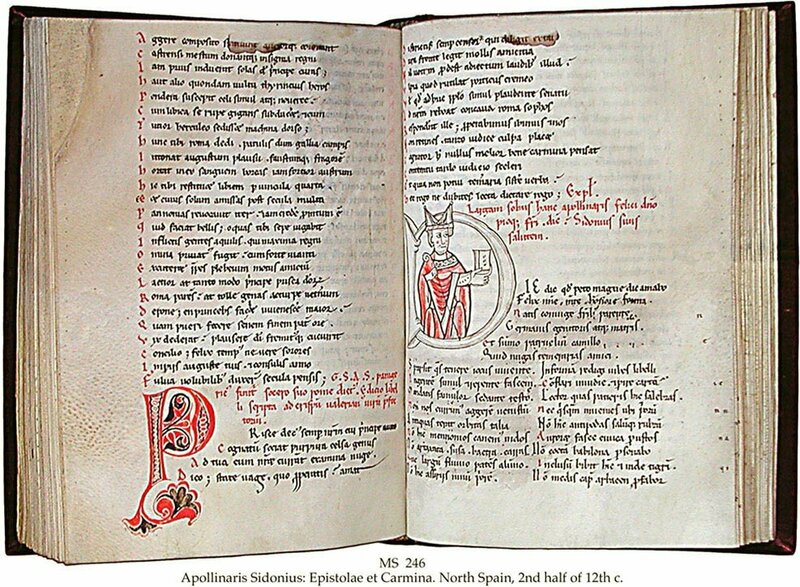 Description	 MS in Latin on vellum, Leon?, North Spain, 2nd half of 12th c., 132 ff. 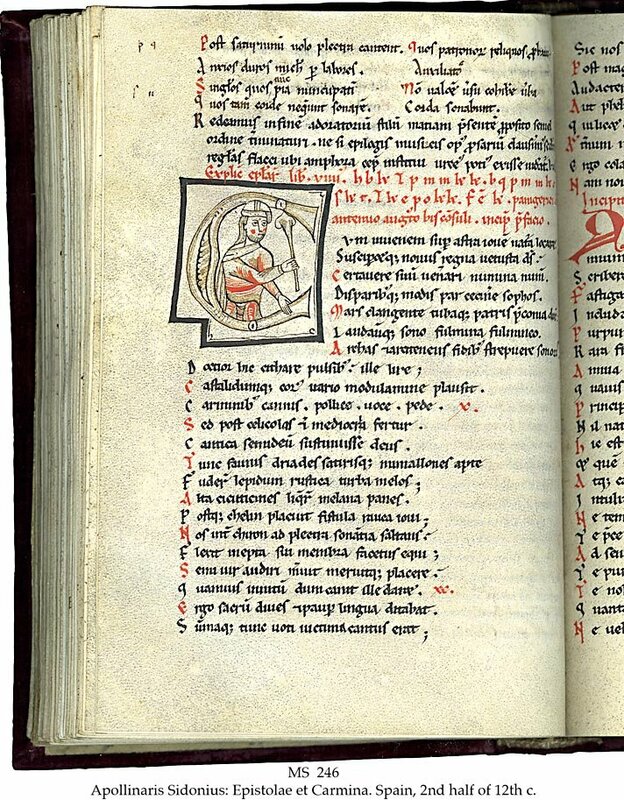 (complete), 24x17 cm, single column, (20x12 cm), 32-33 lines in Romanesque book script, headings and initial letter on every line in red, 2-line initials in red, 10 large decorated initials in ropework or leafy pattern in colours, 2 large historiated initials in colours. Binding	 France, 17th c. red velvet over wooden boards, sewn on 5 bands. Provenance	 1. Balthazard de Villars (1557-1627); 2. Lord Mostyn, (until 1920); 3. Sotheby's 13.7.1920:108; 4. Edmund Hunt Dring, Surrey (1920-1928); 5. Edmund Maxwell Dring, Surrey (1928-1989); 6. Quaritch, London. De-accessioned 2008. 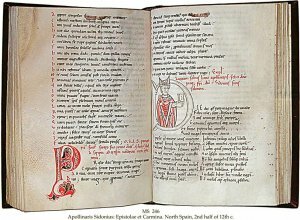 Commentary	 The MS contains the complete works of Sidonius, i.e. all the poems (24 Carmina), and the 147 letters, which is rare. 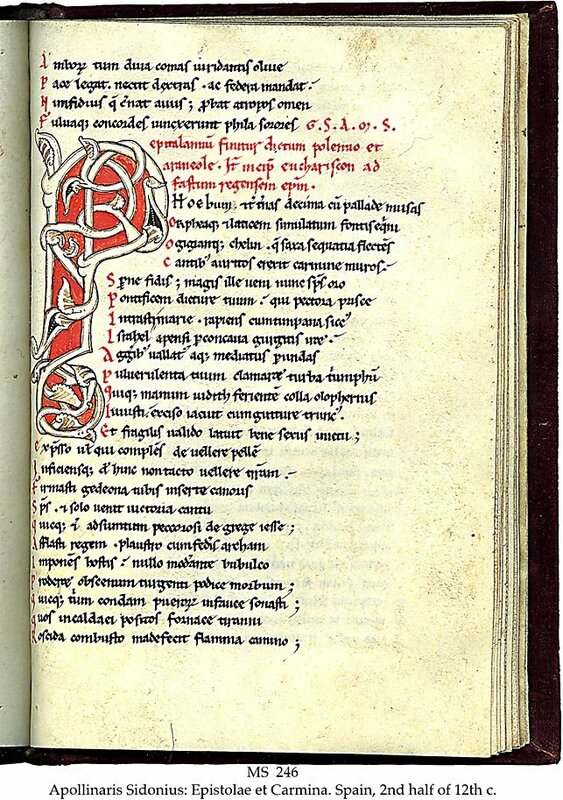 There are 4 major text families, which derive from a lost archetype of the 8th c. The earliest surviving MSS are of the 10th c. In private hands, Sidonius is only recorded in The Schøyen Collection, MS 1650/2 of the 10th c., MS 1650/1 of the 11th c. and MS 246 of the 12th c. Gaius Sollius Apollinaris Sidonius (c. 430-480), bishop and saint, Gallo Roman poet, was befriended with the 3 Roman emperors Avitus, Majorian and Anthemius, of his time. Living in Auvergne occupied by the Visigoths in 475, he could observe in his letters the final collapse of the Western Roman Empire in 476, seen from both sides. They are the best and most reliable account of this major event in Roma’s and Europa’s history and culture. The poems of the last major classical Roman author were addressed to friends, and are replete with mythological allusions. Exhibited	 1. Conference of European National Librarians, Oslo. Sept. 1994. 2. "Preservation for access: Originals and copies". On the occasion of the 1st International Memory of the World Conference, organized by the Norwegian Commission for UNESCO and the National Library of Norway, at the Astrup Fearnley Museum of Modern Art, Oslo, 3 June - 14 July 1996. 3. Oslo Katedralskole 850 år, Jubileumsutstilling 10. - 14. March 2003.